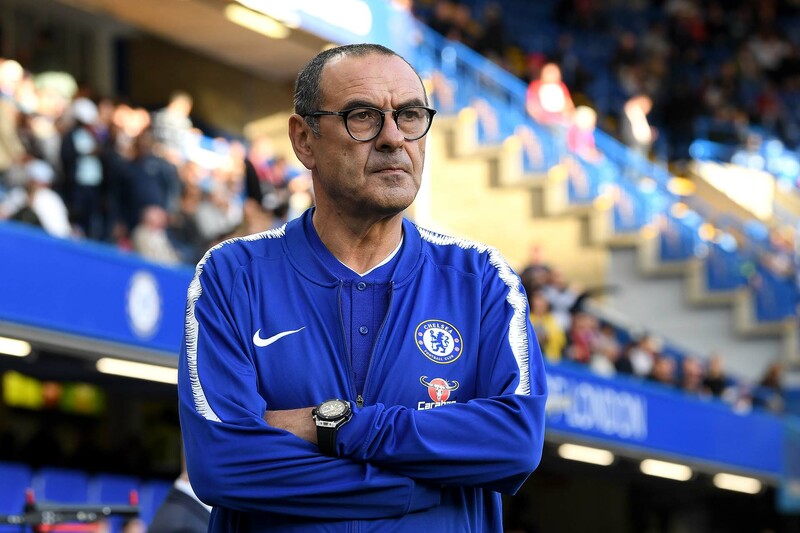 Maurizio Sarri, looks on ahead of the Premier League match between Chelsea FC and Liverpool FC at Stamford Bridge on September 29, 2018 in London. Five years ago, Chelsea travelled to Anfield amidst what felt like a celebration honoring Liverpool’s coronation as Premier League champions for the first time since the creation of the Premier League and their first title in English football’s top flight for 24 years. On that day, amidst all sorts of complaints about the fixture list, Jose Mourinho led Chelsea out of the tunnel at Anfield with a rotated squad that was motivated to delay Liverpool’s title challenge on that day. No one could have predicted what actually happened in the match, as Chelsea almost immediately put the Anfield crowd on edge, and just before the half, a Steven Gerrard slip and a Demba Ba goal destroyed the script. A nervy Liverpool couldn’t find a way through a resolute Chelsea defence, and with just two matches to go, Liverpool’s title hopes faded away. Fast forward to 2019, and Chelsea have the same opportunity on Sunday, albeit with more matches left to play this season. Just like 2014, Liverpool are a side that plays fast, attacking football. However, Chelsea are not the same resolute defensive side that they were back then and also opt for a more attacking approach. When these two teams met back in September, it was Chelsea that were the in-form team just starting out under Maurizio Sarri, and an exciting 1-1 draw played out, courtesy of a Daniel Sturridge wonder strike late in the second half. The intensity of the match was high, and Chelsea can expect the same at Anfield on Sunday. But the Anfield crowd can run on emotions at times, often helping to inspire their team. But they can also be quite nervy in tight matches, especially with their burning desire to see their team back amongst the best in England’s top division. Both teams are enduring a bit of fixture congestion. Liverpool are returning from a trip to Portugal against FC Porto in midweek, while Chelsea travelled to face Slavia Prague on Thursday. Sarri’s selection on Thursday suggested that Sunday’s match was a priority, resting Eden Hazard and N’Golo Kante and starting Pedro and Willian. Callum Hudson-Odoi’s complete omission from Thursday’s squad leads to the question of whether he will be selected in such a big match in a hostile ground or whether Sarri opts for a more experienced player in the likes of Pedro or Willian to start opposite Hazard. For Liverpool, the question will be how fresh their side is on Sunday. They had two more days of rest more than Chelsea, but unlike the visitors, they started most of their first 11, including the trio of Sadio Mane, Roberto Firmino, and Mohamed Salah. Liverpool will also have to show the mental toughness that they didn’t quite conjure up five years ago, especially given that they will know Manchester City’s result at kickoff. Chelsea will be looking to once again play spoiler in the Premier League title race, but this Liverpool side have show resilience throughout the season by winning matches late that they probably should have drawn. With that resiliency tested on Sunday, can Liverpool’s team keep the momentum going and maintain their place at the top of the table? That will be answered sooner rather than later.